We present an efficient interactive identification scheme and a related signature scheme that are based on discrete logarithms and which are particularly suited for smart cards. 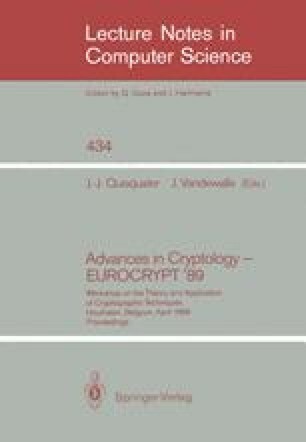 Previous cryptosystems, based on the discrete logarithm, have been proposed by El Gamal (1985), Chaum, Evertse, van de Graaf (1988), Beth (1988) and Günther (1989). The new scheme comprises the following novel features. European patent application 89103290.6 from 24.2.1989. Extended abstract: C.P. Schnorr, “Efficient Identification and Signatures for Smart Cards”, Advances in Cryptology: Proceedings of CRYPTO ’89 (Lecture Notes in Computer Science; 435), G. Brassard, Ed., Springer Verlag, 1990, pp. 239–252.